A porch swing is a southern tradition. On beautiful spring days like we've been having now for weeks it is simply a delight to sit on the porch swing in the late afternoon and chat with neighbors who drop by, listen to the birds, enjoy a cool drink, or read a bit. My swing needs a little TLC. Maybe I'll take it down this afternoon, repaint it, and replace the chains. Or maybe I'll just enjoy it one more day, and work on it tomorrow. The figures are in. This year's Fireman's Ball grossed over $60,000.00! After expenses the Ocracoke Volunteer Fire Department will net about $53,000.00. That is from sales of T-shirts & food, donations made at the Ball, individual and corporate sponsors, in-kind donations, and the two auctions (silent and live). I understand that the live auction brought in more than $15,000.00. Many thanks to Dave Finch and the Dune Dogs, sponsors, volunteers, participants, and especially our fearless firefighters. Everyone considers this fundraiser a rousing success. We've published another Ocracoke Newsletter. This month I share with readers a few pages of Ocracoke reminiscences that my father, Lawton Howard (1911-2002), put down on paper before he died. I call it "Remembering Growing up on Ocracoke." You can read it here. Old time O'cockers could often be found proguing for a living. They'd progue for fish, clams, oysters, crabs, even turtles. Sometimes they'd use a gig (for flounder), a rake (for clams), or tongs (for oysters). Turtle progues were also used on the island. It's getting that time of year again. Already neighbors have been out in Pamlico Sound proguing for clams. Clams don't get any tastier than when you bring them home in the afternoon, and eat them for supper! I just discovered that five years ago (to the day) I mentioned the word "fladget" in this journal. All of the older island natives know the word. It means a piece or chunk of something. Normally it is used to refer to food ("Pass me a fladget of that ham, please. "), or to flesh wounds ("I just cut a fladget of skin off of my elbow. "), but it can be used in other ways too ("Honey, you've caught yourself on that there nail, and ripped a fladget off your dress."). I know that language changes over time, and words like fladget often get replaced...but if you are a younger native islander reading today's blog, consider reintroducing some of our distinctive and colorful words (like fladget, airish, & begommed) into your speech. Your grandparents will enjoy the connection with their past, and your children will have one more reason to celebrate this unique island. Some years ago Maurice Ballance mentioned cunners to me. I didn't know what a cunner was, so he explained it to me. Cunner, he said, is a very old term that was used on the island for a dug out canoe. When I listed the word on this journal several days ago that was still all I knew. This morning I decided to do a little Google research. I thought maybe the term was more generally known in eastern North Carolina and Virginia. And I was right. I discovered a beautifully written article from the May, 1900 issue of Outing magazine, written by A.J. Kenealy, entitled The "Cunners" of Chesapeake Bay. Kenealy describes the cunner & its predecessor (the native American dug out canoe). He explains in detail how the double ended boat was built, how it was rigged, and how it was used. I'm sure the Ocracoke version was identical, or nearly so. You can read the 1900 Outing article here. It is quite interesting. Now I need to go back to visit Maurice and ask him more questions about the Ocracoke cunners! Maybe once a week or so Lachlan and I will stroll down Howard Street and over to the ice cream and fudge shop at the Community Store Square. Lachlan will examine the ice cream flavors and make his choice (cookie dough and orange sherbet are his current favorites). Then we'll sit on the bench (sometimes he retreats under the bench, teasing me about sharing) to savor the treat. By the time we get to the bottom of the cup Lachlan is often begommed, so we'll walk out on the dock to rinse face and hands. This page lists a "Glossary of Mountain Speech, An Excerpt From Southern Mountain Speech" by Cratis D. Williams, and edited with an introduction & glossary by Jim Wayne Miller & Loyal Jones, Berea College Press, 1992. Both "begommed" and "airish" (today's and yesterday's Ocracoke words) are listed as traditional mountain words. I haven't checked for other words common to both mountain and island traditions, but I'd be surprised if they didn't exist. As the web site notes, "Southern Mountain Speech is not, contrary to popular opinion, an incorrect form of English. It is, rather, the oldest form of English still spoken today. It dates to the time of Chaucer." Much the same can be said about the Ocracoke Island brogue. Several days ago I posted a few old-time Ocracoke words. And I promised to define them in future posts. Today's word is airish. It just means breezy or windy, and maybe a bit cool. It was certainly airish about a week ago (walking on the beach almost felt like being in a hurricane). In other news, the 4th annual Fireman's Ball last night was a huge success. The barbecue was about the best I've ever had, I'm certain the auction raised more money than any previous auction (details when I get them), and the Community Center was packed for the dance. Everyone was in a great mood, and happy to contribute to the fund to build our new fire house. Thanks to all of the individuals and businesses who sponsored the weekend, those who gave items for the auction, folks who donated time and energy, Julia Hutcherson who deeded the land for the new building, and, of course, all of the men and women who volunteer as active fire fighters. If I've missed any, I apologize. Please leave a comment if I have. You can read more about many of these places to eat here. The school gymnasium was packed last night for a talent show produced by the Ocracoke School Arts program. I arrived late because of a previously scheduled meeting, so I missed the break dancing and several other acts. I understand they were impressive. But I did hear the Last Rebels of Rock, beautiful solos by Jasmine, and Casandra, several numbers by Caswell, Caswell, Castro, and Benninck (I didn't even know Evan could play the harmonica! ), and others. In addition to the music, other art students had their original prints displayed, and for sale, on tables at the end of the gymnasium. What creativity! For all of our on-island readers, and visitors who plan to be on the island this weekend....Remember to come out for the 4th annual Fireman's Ball on Saturday. There will be a pig pickin', auctions, and dance, starting at 5 pm at the Community Center. It's a great event for a great cause. And you can read more here. I am the auctioneer, so I perused the items yesterday evening. Everyone should know some of the fantastic items being offered for sale. Today's blog is just a little bit of Ocracoke trivia. Here are a few old-time island words. Any idea what they mean? Maybe some of our island readers will write in. If not I'll give the answers in a day or so. Where has spring gone? It's warmer this morning than yesterday, but still the temperature is only in the upper 50s! Yesterday it was rainy as well as cold. Today it's just windy and cold. But the forecast is calling for warmer temps later today, and for the rest of the week. One good thing about the unseasonably cool weather is that I didn't have much trouble staying inside and getting a lot of "paperwork" done yesterday. It looks like Saturday will be just perfect for the annual Fireman's Ball. Hope to see you there! A dozen monks were sitting in their scriptorium copying manuscripts. Scenes like this had been going on for hundreds of years in the monastery. When the abbot walked by, one of the novices ventured a question. "After all of this copying, Father Abbot," the young man asked, "how can we be sure the texts are accurate?" The abbot pondered the question, then announced that he would personally retreat to the cellar where their archives were housed, and check the parchments for accuracy. He remained secluded for weeks. Finally several of the monks descended the stairs to check on the abbot. They were surprised to see him sitting in front of a large pile of ancient scrolls, his elbows on the table, his face in his hands, weeping profusely. When asked what the matter was, he just kept repeating, "The word is 'celebrate'...the word is 'celebrate'!" We tried it again last night. This time we chose "canoe." Rob didn't even hesitate. Unfortunately Rob's canoe joke isn't appropriate for a family blog! Yesterday afternoon I joined friends at the old (ca. 1830) Soundfront Inn to witness the wedding of Mary Britton and Chase. It was a beautiful affair, outside under the spreading limbs of hundred year old live oaks. The sky was blue and clear. Before the ceremony we sat on the porch in wooden rockers sipping lemonade and iced tea, and chatting. Afterwards we found seats at tables under the canvas tent and enjoyed an assortment of vegetables, salad greens, and meats prepared by family and friends. There was music (mandolin, guitar, and fiddle), horseshoes, and much visiting. The weather was perfect. Vintage typewriters were positioned on the edge of the porch where guests stopped to type messages for the bride and groom. David commented that it was a quintessential southern wedding. The writers and photographers from the popular magazine, Southern Living, would have been right at home. I guess folks might say I'm like the proverbial ostrich, with my head in the sand. I often don't know what is going on in the outside world. A neighbor gave me her newspaper yesterday. It was filled with stories about police corruption, child abuse, murder, robberies, and traffic accidents. I don't subscribe to a newspaper, and can be shocked by what is reported there. But then I remind myself that some of the stories, as horrible as they are, are about incidents in far away states, crimes in other countries, and sometimes even things that happened several years ago. Not to minimize terrible things that people do to one another, but reading about it all in a hometown newspaper (in this case Norfolk, VA) can give the false impression that crime and violence are everywhere...and close by. They are often not, of course. Living on Ocracoke can sometimes seem like Camelot -- idyllic beaches, a nurturing community, friendly neighbors, little crime. Of course, Ocracoke is not perfect. No place is. Last time I checked all of the 750 or so residents were fallible humans. But this island is a reminder that most people are honest and good, and that there are many folks who look after one another. I hope our visitors return home relaxed, refreshed, and reminded that life is good. Perhaps that is a message we all need to hear to counter the bad news we read in the papers. Yesterday afternoon Amy commented that she read that cobblers were making a comeback in these tougher economic times. I've often mentioned to her that my dad seldom hired anyone to do what he could do himself, but I'd almost forgotten about the shoe last that he routinely used to repair our shoes. Then I remembered my mother sitting in the living room darning our socks. I know I have the sock darner somewhere, but it hasn't been used in close to fifty years. Maybe they are making a comeback now, too. In our last post I mentioned wanting to teach Lachlan how to tie a bowline. He did very well, even though he needed a reminder now and then (the rabbit come OUT of the hole...and he hops BEHIND the tree). Thinking about knots, and my dad's ability to do most anything he set his mind to, I took a photo of a bow fender (with turk's head) that he fashioned in the 1950s. When I was a child my father taught me a few basic knots -- square knot, half hitch, clove hitch, sheet bend, and bowline. 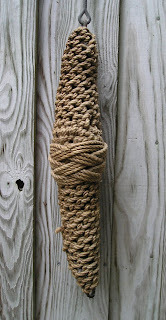 He also showed me how to splice rope and make a rope boat fender (though I never mastered those skills). This morning Lachlan and I will be spending some time together. I'm hoping I'll be able to teach him to make a bowline. I don't know what makes me think I can do this. He can't even tie his shoes yet! I found this web site that explains how to tie a bowline: http://www.apparent-wind.com/knots/bowline/ in case any of our readers are interested. The bowline is one of the most versatile knots ever created. In the nineteenth century and early twentieth century the federal government appointed wreck masters in coastal communities. These individuals were empowered to take charge of cargo and other goods thrown on shore after a shipwreck. Of course Ocracokers and other Outer Bankers snatched up whatever they could manage to salvage before the official wreck master could gather the items together and protect them from looters. Once collected, the wreck master contacted the shipping agent who arranged for a vendue, or auction. The vendue (an old French word) was the occasion for much excitement in coastal areas. Residents and visitors would gather around for the entertainment as much as for the opportunity to purchase items at bargain prices. Saturday, May 23 -- Ocracoke Volunteer Fire Department auction (click here for more information). Friday, June 5 -- OcraFolk Festival auction (click here for more information -- if festival schedule, etc. are not posted today, check back soon. I'm told on good authority that updates are in the works). I suppose we should be grateful that some things on the island have changed. I don't believe the doctors and nurses at our Health Center will recommend any of these cures today. Yesterday, after messing about outside (mowing the grass and straightening up things in the yard), and installing an air conditioner in my office (with the help of David and neighbor Matt) I joined Matt and his family for gin & tonics and an early afternoon chat on his front porch. Matt's mother (Beth) and father (Ben) are visiting for a few days. Beth is a Lutheran minister and we had a lively and spirited discussion about religion and theology while enjoying the perfect spring day. We had a delightful time with much laughter and good humor. On the way home I met Marcie Brenner (she and her husband Lou are now an important part of Molasses Creek) and her daughter Charlotte. Marcie had no problem convincing me to join her to meet Tom & Carol for a light dinner on the dock at the Jolly Roger. The weather has been so spectacular that I couldn't resist the offer to spend the last few hours outside by the water. Everyone is hoping this weather will last for months! Sometime around the turn of the twentieth century a Dr. Morgan found his way to Ocracoke where he treated (and cured) young Billy Scarborough of lockjaw. I understand that folks around these parts considered it a miracle. It was the first known cure for lockjaw that anyone here had ever heard of. By all accounts Dr. Morgan became something of a curiosity because of his education, refined manners, preferences for gourmet foods (he enjoyed terrapin stewed in wine), and sartorial excellence. Scuttlebutt on the island suggested that he was part of the wealthy and respected J.P. Morgan clan, and had been "exiled" to Ocracoke as a black sheep of the family. He died only a few years after moving to Ocracoke, and is buried in an unmarked grave on Live Oak Road. Only one member of his birth family attended the funeral. Reports indicate that this relative created quite a stir because of his fine suit and expensive shoes. I have done a little Internet research on the J.P. Morgan family. Most sites say that J.P. (1837-1913) was the only son of Junius Spencer Morgan (1813-1890). Others mention another Junius Spencer Morgan (1867-1932) and identify him as J.P.'s nephew. If this is accurate, then J.P. must have had a brother. I wonder if the history of this side of the family has been suppressed. If any of our readers has more information that might shed more light on this Ocracoke Island mystery we'd love to hear it. This morning at 11 o'clock a crowd will gather at the British Cemetery to remember the four sailors buried there (Thomas Cunningham, Stanley Craig, and two unknown men), along with the remainder of the crew of the HMT Bedfordshire which was torpedoed on May 11, 1942. The ceremony, held regularly on the Friday closest to May 11, also honors all men and women who served and lost their lives defending our coastline during WWII. The Bedfordshire was attacked by the German U-boat U-558 shortly before midnight on May 11. All hands were killed. This year, as in years past, representatives of the US Coast Guard, the British Royal Navy, and other dignitaries will be on Ocracoke pay their respects. I just learned that the Outer Banks (including Ocracoke, of course) is featured in the April, 2009 edition of "Gourmet, The Magazine of Good Living." The article, Sea Change, in the Gourmet Travels section, starts on page 98. The author has great things to say about the Cafe Atlantic & Thai Moon Restaurant. One whole page includes photos from these two eateries, as well as Edwards Motel, the Veggie Stand, and the Atlantic Ocean. The Back Porch and the Flying Melon are also recognized as among the Outer Banks' best restaurants. The article is well written and surprisingly accurate. The author, Jane Daniels Lear, is a frequent visitor to the Outer Banks, and has clearly done her research. She even includes a recipe from the Back Porch Restaurant for Frances O'Neal's Fig Cake. Be sure to pick up some fig preserves on your next late summer or early fall visit (that's when locals put up figs...and you can usually find them on the Village Craftsmen web site that time of year), so you can make one of Ocracoke's favorite cakes yourself. If you can't find the Gourmet magazine you can get the fig cake recipe from the Village Craftsmen web site. Just click here. Years ago there were three Ocracoke men who were very good friends, two brothers and another man. They played poker often, and their get togethers always involved a large jug of homemade meal wine . Eventually one of them “got religion" and renounced strong drink. He convinced his brother and their friend to join him at a revival. At the church he got testifying, and claimed to have given “his heart to the Lord.” He shouted out that “Jesus is coming" and proclaimed in a loud voice that he was ready, no matter how the Lord chose to make his appearance. To emphasize his preparedness he bellowed out that he had “one foot on water, one foot on land, and one foot in the sea.” They say his brother got so tickled, he had to crawl out of the church. I love all of the new growth this time of year. Azaleas and daffodils are blooming around the island, and everything just seems more alive. Walking the short path through the "woods" from my home to my office I notice the new, light green leaves on yaupons and live oaks. The ground is littered with live oak leaves as new leaves burst forth (live oaks shed in the spring, not the fall), and cars, picnic tables, and walkways are covered with a light dusting of yellow-green pollen. Even the poison ivy is lush and healthy. It's all part of the cycle of life, and I'm happy to be part of it. Yesterday I woke up thinking it would be a great day to fly our paper kite. I could see the tree branches blowing in the wind. Before noon I rounded up Lachlan and we headed for the beach. I was surprised by how much windier it was out by the water (though I should have known -- it always is!). We got the kite up immediately, but it was so unstable...just dipping and twirling wildly. You would have thought it was one of those fancy store-bought stunt kites. I handed the spool of string to Lachlan and he let the kite out so it soared over the dunes...then plunged into the sea oats. As I wound up the string (which was tangled in grass, twigs, and itself) Lachlan took off on the ridge of the dunes, seeking adventure. When I looked up he was just a tiny speck! I hobbled after him (my knee is still bothering me). I figured he'd have to stop at Hatteras Inlet! Luckily he found something to engage his attention and I caught up with him (I had gotten my daily walk by then), and we took our broken kite back home for repairs. Maybe some of our readers remember making paper diamond kites as kids. I have forgotten whether an unstable kite means that I should make the tail longer, or cut it shorter. Or maybe the horizontal cross piece is not bowed enough. Any insights would be appreciated. Of course I need to rebuild the kite before I can fly it again. But we still had fun. Visitors to Ocracoke sometimes assume that nothing much happens on the island. A conversation with almost any local will change this perception. Yesterday I hardly had time to take a nap! A friend from Manteo has been visiting for the weekend. He asked me to give him a quick tutorial on the basics of web site development. I explained that my knowledge is very, very basic, but he pointed out that it was much more than he knew. So that consumed much of yesterday morning. After lunch I joined a couple of hundred other folks to remember the life of Larry Williams, a talented and creative native islander who died recently. Many people remembered his numerous contributions to our island community, including his love of history, storytelling, dance, and celebration of family and friends. Larry will be missed by the many people whose lives he touched. Later that afternoon I had a chance to walk on the beach which was wonderful, as usual, in spite of the blowing sand. After a quick bite to eat I biked out to the school for the annual cub scout pinewood derby. The boys were so excited, and the races were enjoyed by all. Back home I had just a few minutes before friends came by for a couple of glasses of red wine and time to reminisce and share stories of several decades of island life. After everyone left I collapsed in bed without even picking up my book. It was a busy and rewarding day. Every now and again I sit on my front porch and notice that I've never painted my picket fence. My brother assures me that it would be a very bad idea to paint the fence. But it would look so nice white, I tell him. Then he reminds me how time-consuming it is to paint a picket fence...and how much worse it will look when the paint starts to peel. This morning I volunteered to paint one of the porch rockers at the Preservation Society Museum. I remembered how much I dislike painting...especially slatted objects. After an hour and a half (and paint on my arms, shoes, and T-shirt) I have become firmly convinced (at least for the time being) not to paint my fence. If I'm sitting on the pizer when you next walk down Lawton Lane, don't hesitate to let me know that the fence looks just fine unpainted.